At Tibooburra Angus our mission is to consistently produce quality stud cattle with genetic traits in the top 5% of the breed. Our participation in the Angus Group Breedplan enables us to accurately measure, monitor and track the genetic traits of our Angus Cattle. We believe that our strongest asset is the quality of our female herd. 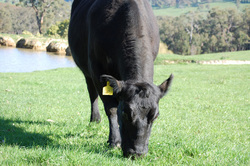 Each year we run our females through a stringent AI Program where we cross them with a selection industry leading sires. The aim of our program is to target the genetic traits listed below and in turn, produce quality, unbiased cattle. We believe that this will equate, not only to cost savings in the paddock but also cost increases in the sales yard.